Since it was released earlier in the summer the Samsung Galaxy S3 has become one of the most sought after smartphones available to consumers. 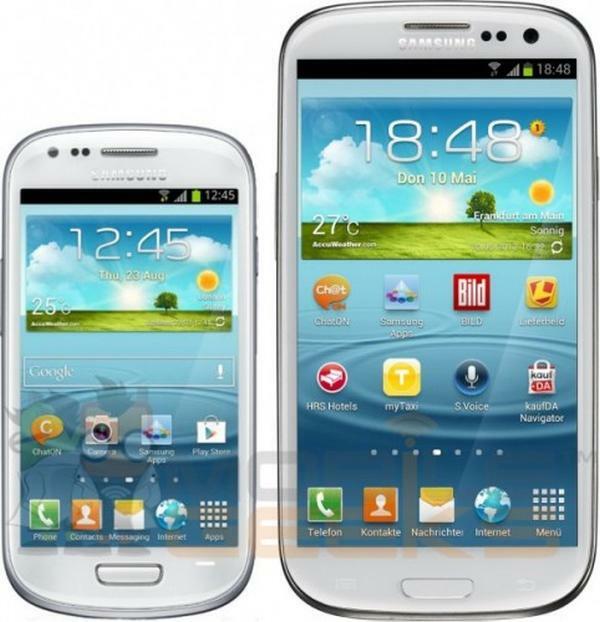 Now the company look set to release a Samsung Galaxy S3 Mini that is believed to feature Android 4.1 Jelly bean at launch. We told you last week that Samsung will be holding an event tomorrow to showcase the Galaxy S3 Mini, and now some details of the device have been leaked ahead of the press event in Germany tomorrow. According to a report over on the Android Community the handset will be released with Jelly Bean already installed, and the new smartphone will feature a 4-inch WVGA Super AMOLED display at 800 x 400 resolutions. This will give the display a ppi of 233 and under the hood is a dual core STE U8420 processor clocked at 1.0GHz. Other features include 1GB of RAM, 16GB of built in memory that is expandable up to 32GB via microSD card, VGA front facing camera, and a rather small five megapixel camera on the back. There is also Wi-Fi, Bluetooth 4.0, microUSB, 3.5mm headphone jack, and tri-band HSPA (900/1900/2100) and quad-band GSM/EDGE radios inside. It seems the new smartphone will be quite a bit smaller than the Galaxy S3, measuring in at 121.55 x 62.95 x 9.85 mm, and there will also be NFC compatibility along with Android beam as well. There are also claims that the touch button design has been changed, and from the images it can be seen that the front camera and sensors have been repositioned as well. Supplying the juice to the handset is a somewhat weedy 1500 mAh battery unit, and it is being claimed by some sources the device may be priced at â‚¬399/$513 unlocked, but obviously this will only be made official tomorrow at the Samsung event. Will you be getting the Samsung Galaxy S3 Mini? A 4″ S3! Fantastic, but why do they have to dumb it down – processor, Camera, etc.? Apple can make a full powered 4″ phone. Why can’t Samsung?